For other uses, see Perama (disambiguation). 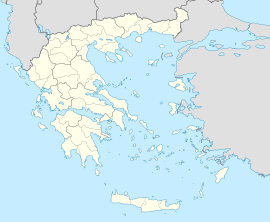 Perama (Greek: Πέραμα) is a port city and a suburb of Piraeus and Athens (Greece). It lies on the southwest edge of the Aegaleo mountains, on the Saronic Gulf coast. It is 8 km northwest of Piraeus, and 15 km west of Athens city centre. The municipality has an area of 14.729 km2. It forms the western terminus of the Port of Piraeus (Athens' port) and there is also a passenger port that provides ferry services to Salamis Island. This page was last edited on 12 August 2018, at 12:24 (UTC).